Like oh so many Vancouverites, neither Dana nor I actually grew up there. She hails from Sarnia and I from Prince George, but we both fell in love with East Vancouver. Two years ago, I moved into a big blue heritage house in Strathcona, the city’s oldest neighbourhood. It borders the east side of Chinatown, an area I’ve walked through countless times, and have seen change, even in two years. It’s guarded by an impressive gate on Pender, and home to an eclectic mix of people, businesses, and noble – if somewhat crumbling - buildings. The Chinese grocers, herbalists, and souvenir shops are still there, but there’s a new generation - both Chinese and non-Chinese - moving in. Some call it gentrification, others call it revitalization, and as with changes in any community, most everyone has an opinion on it. Bao Bei and The Keefer have both extended their patios onto Keefer Street for the re-vamped Chinatown Night Market. It runs on weekends throughout the summer, and is an ever-changing mix of dim sum vendors, bubble waffle-makers, curios, clothes, food trucks, fruit pies, and vintage goods from shops like Duchesse. There’s a stage with nightly entertainment, outdoor ping-pong tournaments, and open air movies. Vancouver’s Night Market is tiny in comparison to Richmond’s two battling giants (which I wrote about many times while blogging for Tourism Richmond), but that’s not necessarily a bad thing. It’s just a different vibe. 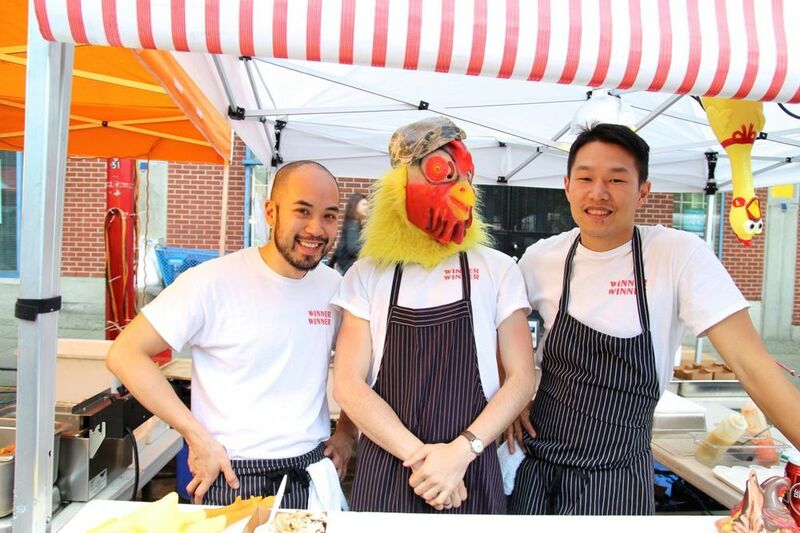 This year, there’s a new booth at the market that perfectly represents Chinatown’s upcoming generation: Winner Winner Chicken Dinner. If that name doesn’t win you over, I don’t know what will. ginger/scallion) are dished up for six bucks. and two sauces – chili, and ginger scallion. try if you live anywhere (I repeat, anywhere) near it. We’ll be talking more about them later. Yes, times in Chinatown are a-changin’, and we’re going to talk about some of the shops there in upcoming posts. For now, here are some of our favourite places to visit while in the area, and one further bit of advice: if you want excellent, more traditional Chinese food in Vancouver, visit Richmond!